The Kryptonite Evolution Series 4 is a fantastic lock. Although it’s just one level up from the budget Kryptolok Series 2, it offers a huge jump in protection for only a small increase in price. At 14 mm, the shackle of the Evolution Series 4 is only 1 mm thicker than that of the Kryptolok Series 2. However, it’s made from a completely different type of steel. This MAX-Performance, hardened steel is much stronger than the steel used in Kryptonite’s cheaper locks and provides far better protection against cutting attacks from bolt croppers and angle grinders. The shackle is also double bolted which means that it’s locked to the cross bar on both sides and would have to be cut twice to defeat it. The double locking also provides much better protection from the leveraged twisting attacks which are commonly used to defeat inferior u-locks. The cross bar itself has a patented oval shape, which is again different to the usual round shape and Kryptonite claim that this provides further, increased protection. All this is reflected in the security ratings of the Evolution Series 4. Kryptonite themselves give it 8/10, a rating which is only bettered by the locks is their New York range. 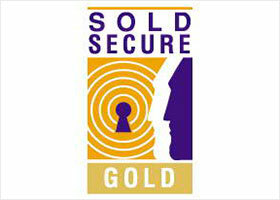 Sold Secure, the independent lock testing organization award it a Gold rating. And ART the Dutch lock testers give it 3/5 stars. These are very high ratings which reflect the very high level of security that this lock offers. High levels of protection usually come at a price: heaviness. And the Evolution Series 4 is no exception. The standard sized version of the lock measures 4 x 9 inches (10.2 x 22.9 cm) and weighs 3.75 lb (1.70 kg). This is about the same as 4.5 cans of coke, which is a pretty substantial weight to carry around every day. You can of course carry the lock in your bag, or attach it to your luggage rack or pannier. But I’d imagine that a good frame mount would be more convenient and preferable for most people. The good news is that the Evolution Series 4 comes with a Kryptonite “Transit FlexFrame-U transportation system”, which basically allows you to fasten the lock to various parts of your bike’s frame. Unfortunately, the bad news is that this frame mount (which is provided with most Kryptonite u-locks) is the target of many complaints. These complaints usually concentrate on two issues. Firstly, that the instructions explaining how to fit the mount to your bicycle are impossible to follow. And secondly that the mount doesn’t hold the lock securely in place so that it works lose, swings about and sometimes even falls from the bike! While the instructions are a bit confusing, Kryptonite do provide a clear and helpful video on YouTube which should make fitting the frame mount quite straight forward. Some of the problems with the mount not fixing securely to the frame or not holding the lock in place may be due to the mount not being fitted properly in the first place. Many others are probably due to the universal nature of the frame mount. Because it needs to fasten to all types of bike frames, invariably it won’t fasten well to some of them! And of course these problems may also be exacerbated by the sheer weight of the lock. However, I wouldn’t let any doubts you have about the frame mount put you off buying this lock. If you follow the instructions in the video, it may fit your bike perfectly and cause you no problems. And if you do have problems, don’t forget there are alternative ways to carry the lock and there are even third party frame mounts available that might suit your needs. The standard sized version of the Evolution Series 4 measures 4 x 9 inches (10.2 x 22.9 cm) internally. This should give you loads of options when you’re looking for somewhere to lock your bike. Bike racks, parking meters, railings and street signs shouldn’t present any problems. However wider lampposts may be tricky! And if you need something longer (perhaps to lock up two bikes at once), then Kryptonite offer the Evolution Series 4 LS which is 2.5 inches (7 cm) longer and slightly heavier. You get three keys with the Evolution Series 4, one with a LED light to help you find the key hole in the dark. You are also eligible for the Kryptonite Key Safe Program which will (once you’re registered) send out replacements should you ever lose your keys. The first set is even free! There’s a sliding dust cover over the key hole which should protect the cylinder from the worst of the street grime and dirt which might otherwise block the mechanism. However, you need to be careful that in cold, wet conditions, water doesn’t collect and freeze behind the cover as this will also jam the lock. I have written much more about lock maintenance, but the bottom line is that if you regularly clean and lubricate this lock, you shouldn’t have many problems. The Evolution Series 4 is eligible for Kryptonite’s Anti-Theft Protection Program which does act as a kind of insurance. 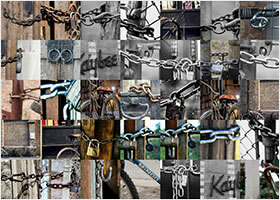 If you opt to take the cover, should your bicycle be stolen as a result of this lock being broken, Kryptonite should pay you up to $2,250 or £1,000 depending on the value of your bike. I go into much more detail about the anti-theft protection offered by all the brands in the Abus vs Kryptonite vs OnGuard page. But to summarize here: these schemes are not free, you need to register as soon as you purchase your lock and they impose certain conditions that make it difficult to make a successful claim. I would advise you to take out separate, specialized bike insurance or get your bicycle covered by your home insurance policy instead, as this will offer more reliable protection. 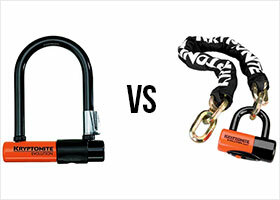 The Kryptonite Evolution Series 4 is one of the very best portable bike locks available today. It’s a practical size. It provides one of the highest levels of security. And as with all Kryptonite locks, you get fantastic after sales support. It is a heavy lock though and you may have some trouble carrying around daily. So check the weight before you commit to buying it. But if you live in a big town or city or cycle on a university campus you probably need a lock which is rated Sold Secure Gold. And Sold Secure Gold locks are either heavy or small. If you are confident that you can always find a place to lock your bike in a bike rack then you might want to consider a Sold Secure Gold mini u-lock. But if you feel you might need more options, then a standard sized u-lock is a better choice. In which case, the Evolution Series 4 is a great value standard sized u-lock offering a high level of security at a very reasonable price. So could it be the lock you’re looking for? If you’re looking for something lighter, something cheaper or even something more secure then there are of course alternatives. But if you’re still unsure, then my complete guide to choosing a bike lock may be of help. The Abus GRANIT X Plus 540 is a very, very secure bike lock. Just like the Evolution Series 4 it’s Sold Secure Gold and was awarded 3/5 stars from ART. In actual fact, I think it offers slightly better protection than the Kryptonite lock. And it also comes with a better frame mount and is almost 15% lighter than the Evolution Series 4! So what’s the catch? Well, it’s significantly more expensive. But usually the best things in life cost a little more and for me, the GRANIT X Plus 540 is the best all round portable bike lock available today. And if the Evolution Series 4 is just a little too heavy and the extra cost is not a significant issue, this could be the best lock for you. As always, OnGuard offer a similar product that costs just a little less. The OnGuard Pitbull STD is around the same size and weight as the Evolution Series 4. And it also has a 14 mm shackle and a Sold Secure Gold security rating. But the OnGuard Pitbull is usually much cheaper than the Kryptonite lock. You wont get the same level of after sales support and you may need to be slightly more careful with your lock maintenance. But the OnGuard Pitbull is a very secure lock at an incredibly cheap price. So if you’re looking for the ultimate value for money in a high security lock, this could be the one for you! There aren’t many locks that are more secure than the Evolution Series 4. However the Kryptonite New York Standard is one of them. With a 16 mm shackle it’s rated 9/10 by Kryptonite, Gold by Sold Secure and has 4/5 stars from ART. Of course this means that it’s also much heavier than the Evolution Series 4. In fact, at 4.35 lb (1.97 kg) it’s almost 16% heavier. But along with the New York Fahgettaboudit Mini it’s one of the most secure bike locks available today. And if you’re looking for a standard sized u-lock that’s even more secure than the Evolution Series 4, it’s probably the best lock for you! The alternatives aren’t right either? Don’t worry, my simple 3 step guide will find the right lock for you and your bike! Can this lock be cut with manual bolt cutters? Theoretically, if it’s less than 16 mm then it can be cut by manual bolt cutters. However, in practice it will depend on a whole host of factors. For starters, they would need to be the very biggest 36″ or 42″ bolt cutters. And even then it would depend on how sharp the jaws are, how heavy and experienced the person using the bolt cutters is and most importantly whether the thief can get the lock into a favorable position (close to, or on the floor). With this lock, I would say it’s very, very unlikely that it will be defeated out in the street with bolt cutters. You’re more at risk from leverage attacks with scaffold poles, bottle jacks or angle grinders. And while you’ll never be able to stop someone with an angle grinder, you can prevent the other two attacks by filling the space inside the lock with as much bike and immovable object as possible. This is a really secure lock though, so as long as you’re using it correctly, you can buy in confidence. I was thinking of getting the New York STD model, but I think I’ll use this lock and combine it with the Kryptonite Evolution LITE Mini-6 for the front wheel. Hellow on kryptonite site it says kryptonite series 2 is also made with MAX-Performance, hardened steel is this a upgrade of this model? The Kryptonite range is very confusing at the moment! But yes, it seems like the Evolution Mini 5 is very similar to the Series 2 Standard. They’re both 13 mm Max Hardened Steel. They both feature the bent foot design. And they’re both Sold Secure Silver and ART 2/5 Stars. However Kryptonite rate the Series 2 as 6/10 and the Mini 5 as 7/10, presumably because the Mini 5 is smaller and therefore less susceptible to leverage or car jack attacks. The Evolution Series 4 is completely different and definitely an upgrade from the Series 2 though since it’s 14 mm, double bolted, Sold Secure Gold and ART 3/5 stars plus 8/10 from Kryptonite! The rating for this lock was 7-8 on the kryptonite scale… Does it mean that it’s a silver rating rather than Gold? I checked the Amazon page and that’s the only rating I see. Moreover, what’s your thought on the Abus STD 430? A cordless grinder will take 3-4 minutes and create lots of noise. A hydraulic cutter is silent and after some pumps it will snap. 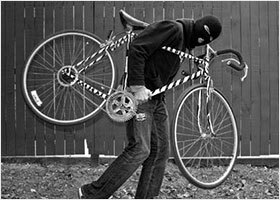 If the thieves want your bike, they will find a way to take it. So whats a detterrant, an ugly bicycle that looks cheap for starters, maybe a movement alarm, cell phone alerts. Also remember to properly lock your bike up!